Much of the research in science education that explores the influence of a racial and gendered identity on science, technology, engineering, and mathematics (STEM) engagement for Black women situate their identities primarily as responses to the oppression and struggles they face in STEM. In this study, we use Phenomenological Variant Ecological Systems Theory as a strengths‐based approach to investigate 10 undergraduate Black women’s perceptions of race and gender on their STEM identity development and engagement. In this study, authors use Phenomenological Variant Ecological Systems Theory as a strengths‐based approach to investigate 10 undergraduate Black women’s perceptions of race and gender on their STEM identity development and engagement. High quality early childhood education and science, technology, engineering, and mathematics (STEM) learning have gained recognition as key levers in the progress toward high quality education for all students. STEM activities can be an effective platform for providing rich learning experiences that are accessible to dual language learners and students from all backgrounds. To do this well, teachers need professional development on how to integrate STEM into preschool curricula, and how to design experiences that support the dual language learners in the classroom. In this article, the authors outline the main components and the iterative design process we undertook to ensure that the professional supports are relevant and effective for teachers and children. Aim/Purpose: The goal of this paper is to examine whether having female robotics teachers positively impacts girls’ performance on programming and robotics tasks. Background: Women continue to be underrepresented in the technical STEM fields such as engineering and computer science. New programs and initiatives are needed to engage girls in STEM beginning in early childhood. The goal of this work is to explore the impact of teacher gender on young children’s mastery of programming concepts after completing an introductory robotics program. The goal of this paper is to examine whether having female robotics teachers positively impacts girls’ performance on programming and robotics tasks. This column describes creating a classroom culture for engineering. Noting the importance of infiltration in the water cycle and in the supply of essential groundwater led the authors to develop an engineering activity in which students are challenged to build a stackable filter using the Earth process of infiltration as a model. Kilpatrick, J., Marcum-Dietrich, N., Wallace, J., & Staudt, C. (2018). Engineering Encounters: Engineering a Model of the Earth as a Water Filter. Science and Children. This column describes creating a classroom culture for engineering. 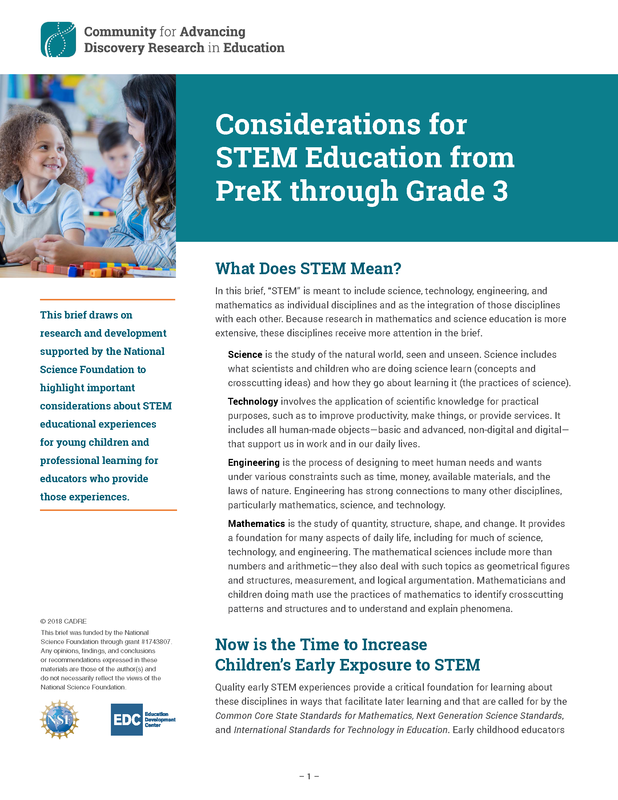 This brief draws on research supported by the National Science Foundation to highlight important considerations for educators and others who design and provide STEM educational experiences for young children. To learn more, visit http://conferences.au.dk/cdio2019/. To learn more, visit https://www.asee.org/events/conferences-and-meetings/annual-conference/2019. This study offers insights into the ways in which two groups of elementary school students constructed approaches for participating in the engineering design practice of collaborative reflective decision-making.